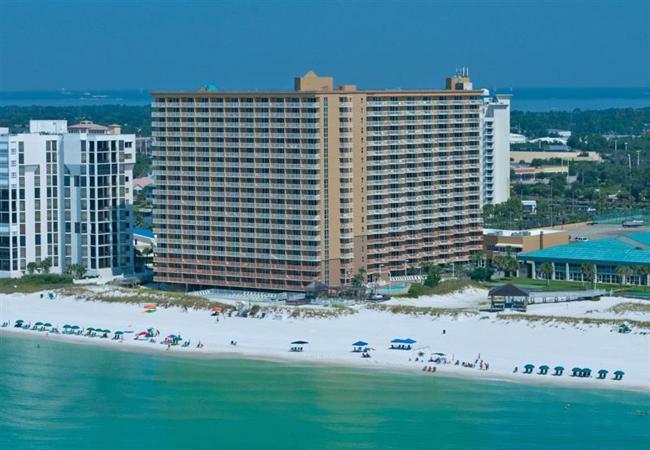 The Pelican Beach Resort is located in the heart of Destin right on the Gulf of Mexico. The one and two bedroom condos are individually decorated for comfort including a kitchen with a stove-top, full size refrigerator and freezer, a microwave, a private balcony with sensational furniture and breathtaking views, cable television and a separate sitting area. This is the perfect vacation for the whole family. The amenities are amazing including two spas, four lush tropical swimming pools, a kiddie pool, video games, shuffleboard, two fitness centers and a poolside grill and bar. Spend your days playing on the private beach or relax in one of the shimmering swimming pools. The common area will entice you with a game and arcade room, a news stand, gift shops and a television. The Pelican Tiki Bar is sure to satisfy your appetite with a sensational poolside bar. You can enjoy your favorite drink or try something new. You can even grab a quick snack at the café and coffee shop. You will find onsite, free self parking and a front desk staffed during limited hours. You can walk to a lot of the renowned attractions, locally sourced restaurants and exciting excursions. Keep in mind, this is a non-smoking property. You will be close to the airport, be able to walk to Big Kahuna’s Water and Adventure Park in just three minutes and The Track Family Recreation Center in just fourteen. You are also a short drive from the Indian Bayou Golf Club and the Morgan Sports Center. Pelican Beach is your dream vacation come true, check out our other vacation rentals in Destin. Destin was voted ‘Best Beach in the South‘ and ‘Top Family Destination’ for nine years running by Southern Living Magazine readers. Also picked as the ‘Best Beach in America’ by USA Today readers. Destin has been inhabited for hundreds of years; first by American Indians as early as the year 600 A.D. and then by Spanish explorers. The modern Destin got its real beginnings in about 1845, when Captain Leonard Destin came here and lead the way for Destin’s major fishing industry. Though people have been visiting and vacationing here for more than 150 years, Destin did not become an official city until 1984. This fact may have a lot to do with the quaint, peaceful atmosphere here. The small fishing village became a tourist resort because of its amazing natural beauty and charm. The residents of Destin pride themselves in the fact that Destin has maintained this environment so well, yet has become a prosperous and enjoyable resort area. The city is located on a peninsula separating the Gulf of Mexico from Choctawhatchee Bay. The peninsula was originally a barrier island. Hurricanes and sea level changes gradually connected it to the mainland. In the 1940s, it technically became an island again with the completion of the Choctawhatchee-West Bay Canal. Destin is east of Pensacola between Fort Walton Beach and Panama City. With an average temperature of 67.2 degrees, you will find the sub-tropical climate just perfect for many of your activities. The Southern winds create comfort and warmth that gently surrounds you. Destin has very few weather extremes and is moderate and beautiful year round.